Vennerable Dhammadinna began her study and practice of meditation at IMS in Barre in 1980 while studying biology at the University of Massachusetts. Upon receiving her degree in 1983 she took robes with the great ascetic Burmese meditation master Ven. Taungpulu Sayadaw at his forest monastery near Santa Cruz, California. In 1984 she returned to IMS for a retreat with Ven. U Pandita Sayadaw and stayed for an extended period of practice, culminating in a three-month retreat with the Indian meditation master Dipa Ma. Soon thereafter Ven. Dhammadinna joined Ven. Taungpulu Sayadaw in Burma and for the next few years lived a traditional monastic life, practicing meditation and joining the daily almsrounds in the villages.After Sayadaw’s death she was invited to join the community of Ajahn Buddhadasa in South Thailand and help teach the monthly retreats. Ajahn Buddhadasa’s progressive outlook on Dharma, his creativity, and his openness toward women as practitioners and teachers made this period of study, practice, and teaching especially meaningful. In 2000 Ven. Dhammadinna met His Holiness the Dalai Lama and he accepted her as a personal student. This began an exciting time experiencing the cross-fertilizing power of the Theravada and Mahayana traditions. 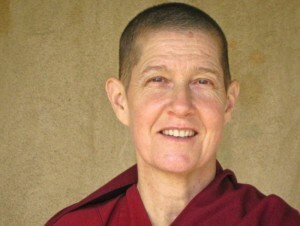 In 2006 she was invited to Seattle where she co-founded Bodhiheart Sangha with Tenzin Jesse. Ven. Dhammadinna is deeply committed to the practices of samatha and vipassana meditation shared by both the Theravada and Mahayana.